Well, I just completed my first "String" Quilt block, this is not the first quilting project I have done. I have made several baby quilts before, about 18 years ago, for a couple of my nephews.. but they were appliqued and not pieced quilts, so I am off on a new endeavour for the "new" crop of offspring in my family.. This block I will put with 3 more as a Pillow top as it is a learning piece.. a Scrappy type, I used old knit medium weight polo shirts for the strings. I cut free hand long angles and then machine stitched to a backing and put 4 little blocks together, I choose the ugliest shirts I had, and I actually Like the way it came out! I was pleased that without pinning I managed to make the points meet exactly in the center.. When I get the other three made and made up I will post it... String quilting and Scrap quilts made from old clothing are a Great way to recycle and re purpose items and keep them OUT of our landfills. We need to make small changes in our rampant consumerism in this country and live every day like it is Earth Day. Yay for quilting...good for you! Completely unconventional - using polo shirts, but who cares, that truly is the spirit of making do, and using what you have. those blocks look great! 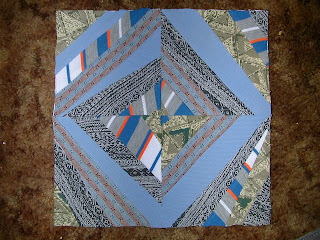 If you have ugly fabric - and you think it is still ugly in the quilt - you should just cut it smaller, or at least that is what I do.